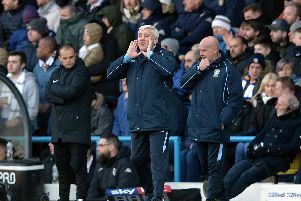 Sheffield Wednesday manager Stuart Gray has urged his side to be more solid defensively if they are to stand a chance of making the Sky Bet Championship play-offs. Wednesday lost 2-0 to Reading at the Madejski Stadium but still remain nine points off the top six. “From two crosses, they scored two goals,” Gray said. “We were then chasing the game. Gray also called for his forwards to be more ruthless at the other end. “They have to show more desire to get into that six-yard box,” he said. “You sometimes have to get hurt scoring goals. If it means taking man and ball and getting a few stitches, then that’s what you have to do. Reading began the better and could have gone ahead early on when Simon Cox raced through on to a Hal Robson-Kanu pass. However, his goalbound shot was well saved by Wednesday goalkeeper Keiren Westwood. On a rare Wednesday break, Chris Maguire forced a fine stop from home keeper Adam Federici, but Reading were soon back in control, with Garath McCleary wasting two opportunities. Pavel Pogrebnyak was not so wasteful in the 29th minute. Stephen Kelly crossed perfectly from the right and Pogrebnyak rose alone to power home a header for his third goal of the season. Eleven minutes later, Reading stretched their lead. McCleary found Nathaniel Chalobah on the break and the Chelsea loanee thundered in a half-volley from the edge of the area for his first Reading goal. Wednesday finally fashioned a reply, when Lewis Baker tried his luck from 20 yards. But Federici was up to task with a sprawling save to his right. Wednesday showed more intent after the interval but were let down time and again by slack approach work. They could have gone 3-0 down, when Jeremy Helan brought down Pogrebnyak in the area, but Westwood saved Robson-Kanu’s weak spot kick.